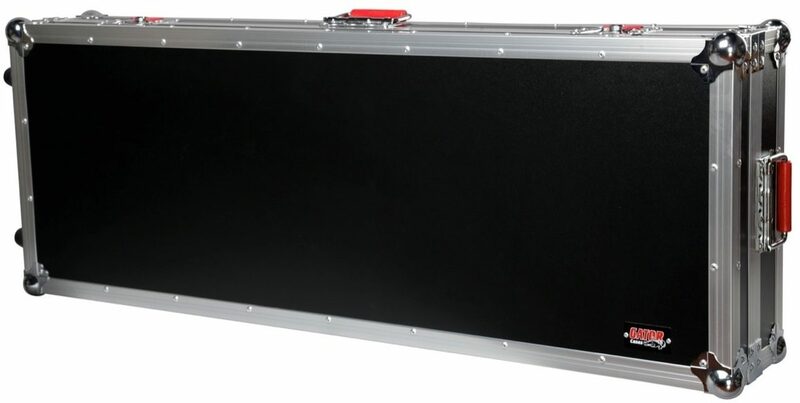 The Gator G-Tour V2 ATA Wood Keyboard Case with Wheels is for the keyboardist who is serious about keeping their instrument safe in all conditions. Gator went to great lengths to make this case extremely rugged yet easy to transport. Heavy-duty plywood construction with a PVC exterior, EVA Dur interior protection and reinforced stackable ball corners makes the G-Tour V2 case virtually indestructible. Gator also gives the case recessed wheels and spring-loaded rubber-gripped handles. - Interior Dimensions: (L x W x H) 44 x 17.38 x 6"
- Exterior Dimensions: (L x W x H) 50.29 x 22.05 x 9.25"
- Shipping Dimensions: (L x W x H) 53 x 25 x 12"
- Interior Dimensions: (L x W x H) 51.25 x 18 x 6"
- Exterior Dimensions: (L x W x H) 58.26 x 22.05 x 8.86"
- Shipping Dimensions: (L x W x H) 61 x 25 x 11"
- Interior Dimensions: (L x W x H) 59 x 19 x 6.63"
- Exterior Dimensions: (L x W x H) 65.94 x 22.05 x 10.04"
- Shipping Dimensions: (L x W x H) 68 x 25 x 13"